The question is: Can you cut your SCOBY? Due to increased demands for Kombucha mushrooms and also because of personal interest, I've begun to research if you can brew with a segment of a kombucha mother. This site and this discussion thread indicate that it's ok, and that Kombucha mushrooms are made of many microorganisms that replicate when cut. In fact, this thread even recommends cutting kombucha mushrooms rather than peeling off layers, because each layer contains different organisms! So, I took the task of cutting a kombucha mother into four quarters. 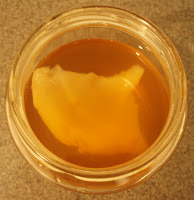 I brewed the batch as normal, putting in just a SCOBY segment rather than a whole mushroom, and we'll see what happens! Look forward to upcoming posts on the development of this brew. that's great. thanks for sharing, Shel! I just cut mine into quarters and it was over three inches thick when I first pulled it. Amazed at how they grow, and hope this mother does wonders!